The Everything But The Kitchen Sink Pasta Sauce is exactly what it sounds like, it's got a ton of veggies, aromatics, meat, cheese & tomatoes! I've always got a jar of this chunky, delicious, & super healthy sauce in my freezer. Make this sauce to clean up the fridge, when leftovers of veggies & cheese start piling up. Prep: In a food processor, throw in garlic cloves and pulse 5-6 times, to chop them fine. Add carrot chunks and repeat the process till carrots are finely chopped. Add mushrooms and pulse 5-7 times to chop them fine as well. Remove in a bowl. Add onion chunks and pulse 5-6 times to chop. Add to the chopped veggies. The reason I do onions separately is so that they stay chunky and don't release their juices. Heat olive oil in instant pot on SAUTE mode (high). When display reads HOT, add ground meat and don't stir for a minute or so, this allows the meat to brown on one side. If making this sauce vegetarian, skip this step. Break up the meat with a wooden spoon or spatula and stir. Add chopped veggies and saute for another minute. Add spices and crushed tomatoes or marinara sauce. If using crushed tomatoes, add more seasoning and spices (check ingredient section). Stir everything together. If the sauce looks thick, add 1/4-1/2 cup water. Close lid. Vent set to Sealing. Pressure cook on Manual/Pressure Cook for 3-4 minutes. Wait 5-7 minutes before manually releasing pressure (NPR5/7). Open lid after pin drops. Stir in grated parmesan cheese and garnish with basil or parsley before serving. 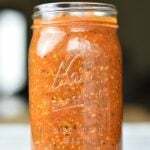 This sauce can also be easily cooked in a big stock pot or sauce pot. Follow all steps above and cover and cook on medium-heat, for about 12-15 minutes, stirring every 3-4 minutes.